Daniel Boone Blazes the Wilderness Trail. Nothing could deter pathfinder Daniel Boone from pushing the frontiers of the United States into the unexplored West. 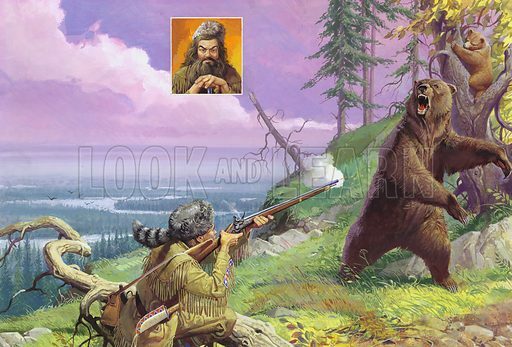 Alone in the untamed countryside now known as Kentucky, Daniel Boone had to learn to fend for himself against wild animals and Indians alike. At the end of two years, all the dangers he had met had only made him more eager to return there with his family and settle down for good. Original artwork. Available worldwide for immediate download up to 13,910 x 9,433 pixels.